Wendell Sonny Lawson: Fifty percent, Lord! I'm talking gross! For a guy diagnosed with a terminal disease, Burt Reynolds sure pumped a lot of life into this film. This is the ultimate in black comedies, a man is told he's got a little over a year to live. We would all react in different ways. Burt Reynolds gets this cheerful bit of news and goes immediately berserk and starts acting all kinds of crazy. Of course everyone around him sees him differently. Wife Joanne Woodward, girl friend Sally Field, parents Pat O'Brien and Myrna Loy. Burt pushes all their buttons except O'Brien who seems oblivious to all. 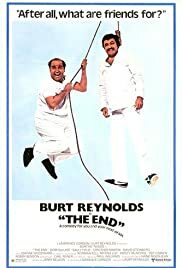 Reynolds always had a marvelous gift for comedy that in his prime period of the seventies was utilized rather well. His career seemed to go in the same path as Tom Selleck's, I think they could have played a lot of each other's parts. Of course it was nice to see two veterans of old Hollywood, Myrna Loy and Pat O'Brien in support. They never disappoint. My favorites though are Strother Martin as the officious head of a mental institution where Reynolds gets committed after some bizarrely unsuccessful suicide attempts and Dom DeLuise as another patient there. DeLuise when he gets going approaches Robin Williams kind of zaniness and he was working on all cylinders in this film. He's ready to offer all kinds of help to Burt to fulfill his mission.